These facts quoted straight from the Alzheimer’s Association are enough to give anyone an idea of the problems a person has to go through if they, or their loved ones have Alzheimer’s disease. Being a maker, I thought about this and decided that I will build a wearable device, a system which can help both patients and their caretakers. When I saw Infineon’s Sensor Hub Nano, it appeared to be a good candidate in such a project, because of its very small size and BLE capabilities. With the accurate pressure sensing, it could be used to detect if the patient has fallen and also tell where exactly the patient is in the house. You will know what I mean by “bare-bones project” when you read the 'Personalising Alzheimer’s Assistant' section. In this section, I will briefly describe how the watch works and outline the steps we have to go through to make it work. Infineon's Sensor Hub Nano evaluation board has a DPS310 barometric pressure sensor, which sends its data through the evaluation board via bluetooth. The pressure, altitude and temperature values can be viewed in the Android app by Infineon (download here) as well as SES2G evaluation software. Users can also build applications for Android with the library Infineon provides, based on their own requirement. The Sensor Hub Nano! Note the very small size! You can find more information about the Sensor Hub Nano here. But, I want Alzheimer's Assistant to work without an Android phone in between. It should be a wearable which can work by itself, as well as have the ability to connect to a smartphone to view the sensor data. So, I decided that I will use an Arduino MKR1000 board due to its small form factor and WiFi capability, and connect it by some method to the Sensor Hub Nano. I had an HC-05 bluetooth module, and so I had to use that for the connection between the Arduino MKR1000 and the Sensor Hub Nano. But first, we need to get the HC-05 properly connected to the Arduino's hardware Tx and Rx pins, taking into account the logic levels. My bluetooth module works at the 3.3v, which is the same as the MKR1000 so there was no need for any voltage level shifter. But if you're bluetooth module works at the 5v level, you may need to use a level shifter similar to the one shown. After matching the voltage levels, we need to pair the HC-05 with the Sensor Hub Nano to start data communication between them, and find an easy way to get them to pair automatically every time the Sensor Hub Nano gets in bluetooth range of the HC-05. To do that, I thought of configuring the HC-05 to act as a bluetooth 'master' device, and pair it only with a specific MAC address; that of the Sensor Hub Nano. So after configuring it like that, once you turn on the HC-05, it searches for a device with a specific MAC address (that of the Sensor Hub Nano), and automatically pairs with it, leaving it up to the user to send and receive data. This is done using AT mode commands for the HC-05 and is covered in the "Configuring the Bluetooth Module" section. Note: I have attached a document I found online, which lists all AT commands the HC-05 supports, so use them as needed. Note: I would like to give a reference to Peter Smith's blog post, which helped me to start the communication with the Sensor Hub Nano using bluetooth. Once we are able to start the flow of data from the module, we need a way to parse the data from it. This was, I must admit, the toughest part of the project; once you send the command for starting the flow of data, the Sensor Hub Nano just sends a stream of data, leaving it up to the device receiving the data to parse anything sensible from it. So, after trying out many methods of varying complexity (which I won't go through here), this was the simplest and the most efficient method which I came up with, to parse data from the Sensor Hub Nano. A display will also be connected to the Arduino to interact with the user, and show any messages, or to display the time or the data from the sensor (More on this as you read on). Once you get the data in the Arduino MKR1000, due to its wireless connectivity, you can send the data to a number of different IoT platforms, such as Cayenne or Blynk. I had decided to use Cayenne for this, as I was impressed by its beautiful interface and easy setup. But, sadly, it had some bugs with the MKR1000 WiFi connection which prevented us from selecting pins. I should mention that the guys over at Cayenne were very helpful, but still the problem wasn't resolved. Therefore, I decided to use Blynk in the end, but they are very similar in usage, so just by changing a few lines of Arduino code, you can switch over from Blynk to Cayenne if you want to test it out or once the issue is resolved. Both have the same features, more or less, so its just your own preference. But the only advantage of Cayenne is that you can access it on a PC as well, while Blynk only works on smartphones. Now, we have received data from the Sensor Hub Nano, got it into the Arduino, and transferred it over to an IoT platform (I'll say Blynk from now on), and so, now you will just need to personalize Alzheimer's Assistant according to your own needs, and that is dealt with in another section (Fall and location detection are discussed there). Note: I have tried to document each and every step in detail, but if you do not know something (like to upload code to your Arduino), it would be a better idea to go to the Arduino homepage, be familiar with it for a while and then come back for this, once you know at least the basics. The first thing you will need to do is to get the MAC address of your Sensor Hub Nano Evaluation Kit. There will be many different ways to do that, but I will tell how I did it. Download Infineon's Sensor Hub Nano Evaluation app (for Android) from here and switch on your Sensor Hub Nano. Open the app, and it will display the Sensor Hub Nano as "IFX_NANOHUB", with the MAC address below it. Note this down as you will need it later. Note: You would be better off un-pairing the Sensor Hub Nano from your smartphone if you aren't using it now because if your phone is nearby with bluetooth on and the Sensor Hub Nano paired, the phone automatically connects with it. And when you set up the HC-05 and try to get it to pair with the Nano Hub, it simply won't connect. AT mode allows us to configure settings of the HC-05 bluetooth module; set the baud rate or set whether to connect as a slave or master device and more. We will need to change some settings for the module to allow it to retrieve data successfully from Infineon’s Sensor Hub Nano. First, upload the "AT Commands" sketch to the Arduino MKR1000. This will allow us to give commands to the Bluetooth module in AT mode, through the Arduino MKR1000. // Sketch modified by me to work with Arduino MKR1000! // The HC-05 defaults to commincation mode when first powered on. 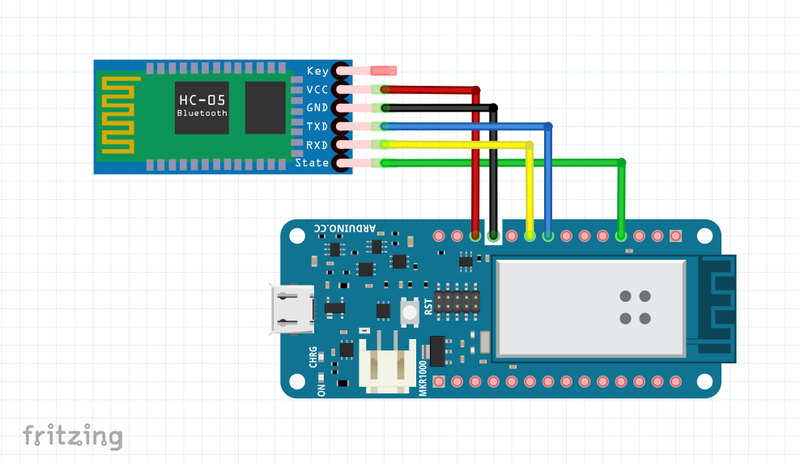 Then wire up only the bluetooth module to the Arduino MKR1000 following the diagram. Note: It would be a good idea to wire it all up first on a breadboard, and proceed to proper wiring once you’ve set it up properly. To change the HC-05 settings, you will need to get your bluetooth module in AT mode. The method for doing this depends upon which breakout board you have and so you may have to do it differently. If you have a module that is different than the one I have, head over to Martyn Currey’s blog here where you can find detailed information about how to get the HC-05 bluetooth modules in AT mode. If you’re stuck, google your problem or comment and I’ll try to help. Once in AT mode you will notice a considerable difference in the pattern of LED blinks on the HC-05. In communication mode, the LED blinks quickly, about 5 times a second while in AT mode the LED blinks once every couple of seconds. Open the serial monitor, set the baud rate to 9600 and select “Both NL & CR”. Note: You will need to set it to newline and carriage return, or AT commands don’t work. Type “AT” in the serial monitor and you should receive an “OK”. If you do, then you can proceed further and give the commands as I did. The above instructions were given so that you can use them even if you have another Bluetooth module, by referring to the commands and what they do. But now I will list the commands I gave for the HC-05 to pair with the Sensor Hub Nano. You should now un-plug the Arduino to turn off the Bluetooth module. This will get it back in communication mode. Now, you will need to test if the last step was successful; you can do that by turning on the Sensor Hub Nano. The blue LED will blink very slowly, once every couple of seconds. Then, plug in your Arduino to your PC, and note the change in the LED blinks on both the HC-05 and Sesnor Hub Nano. There is a noticeable difference, and you should get to know that both the modules are connected. You can now move over to next part, of wiring up the project and testing it. Note: If you have paired your smartphone with the Sensor Hub Nano before, you may have to un-pair it otherwise it would cause connection problems. It can only connect to one device at a time. Once you have confirmed a proper connection between the HC-05 and the Sensor Hub Nano by the LED blinking patterns, proceed to setting up the Blynk app in smartphone. Download the Blynk app (if you haven't already) for your iOS or Android device from here, and scan the QR code through the Blynk app. It will automatically replicate the basic widgets necessary at this time. Do not make any changes here at this point, and just read on. There are two ways to install the required libraries. The first is through the ‘Library Manager’ which is available in the newer versions of the Arduino IDE, and the second is the manual installation. Both methods are described in detail here so check the link out as I won’t be going through that. Once you have installed the libraries, download the attached code and make some changes to it. You will need to add your authentication code from Blynk (That is e-mailed to you when a new project is made in Blynk), as well as your WiFi SSID and password. Once that is done, upload the code to the MKR1000. After uploading the code, wire up the circuit according to the schematic. Then open the Blynk app in your smartphone, and open the Alzheimer’s Assistant project and press the play button. Plug in the MKR1000 (with the HC-05 and display wired up), and you should see the logo, Alzheimer’s Assistant on the display. It will stay for a moment and then you can see the message “Waiting for Sensor Hub Nano”. Turn on the small switch on the Sensor Hub Nano, ensuring that you’re within bluetooth range of the HC-05 module. It should say "Connected to Infineon’s Sensor Hub Nano", and after a few seconds, you should see pressure temperature and altitude values on your smartphone. 1 / 2 • The widgets change colors automatically as specified in the code, and values start coming too! And after a few seconds you will also see the time in 24 hours format, as well as the date, and that syncs with the the internet. If so, congratulations, you have completed the hard part of setting it up, and now comes personalizing it for individual patients, according to their preferences. Up till now, what we have set up retrieves sensor data from Infineon’s DPS310 in a neat and elegant setup, but to make something useful from that, we have to configure the setup according to individual requirement and preferences. Therefore, in this section, I will talk about the code and how to modify Alzheimer’s Assistant to work according to each user’s preference. I will give the code snippet for each ‘feature’ and you can simply add it in the main code with a little changes. Note: When you look at the code I attached for the 'bare-bones project', you will see that it uses functions wrapped in the BlynkTimer. I would be a good idea to use them if you want to do any customization as it can carry out tasks at a specified interval, and also, prevent the Blynk flood error which happens when your hardware sends a lot of requests to Blynk. Also, the code is 'bare-bones' in the sense that all functions are present but not included in the main code; the user has to edit the main code according to requirement, and may have to adjust the time interval at which each function runs. Infineon’s DPS310 is a low cost digital barometric pressure sensor which provides very high accuracy, in a very small form factor. Because of that, it is perfect to use in such a project, and the values can be used to detect falls in an elderly patient, or in which room the patient is exactly. Fall detection: To detect falls, we will need to give a fall value (The difference in air pressure, between two readings over a specified time), and set up a clearance. For example, if the change in altitude between two successive values (over a time of let’s say a second) is between the fall value ± the clearance value, a fall will be detected. I have done a couple of tests and found the fall value should be 0.7, and the clearance value should be ±0.2, but they may not work in all situations. This is due to a simple and understandable reason that when a person falls it can occur in many different ways. Therefore, the use of a secondary sensor (probably an accelerometer) will be necessary to gain more accuracy in the fall detection system, and that will be added to the future work. But it could always be possible that there are other, more accurate algorithms for detecting falls, and I am open to hearing them; feel free to comment if you any ideas on this. Detecting where the patient is: This works similarly to the fall detection algorithm. For example, if you need to know on which floor the patient is, you can get the take the current altitude value and subtract it from the previous. And then compare the difference to a pre-defined value. This will indicate on which floor the patient is. It would just be a matter of using simple if and else logic to determine on which floor the patient is (Altitude values are already present in the main code). That could be indicated using the LED widgets in Blynk. Note: I have not included the location detection in the main code but users can add it as needed, just don't forget to use it as a Blynk timer function. The same technique could also be used to detect in which room a person is. In that case, a secondary sensor such as a motion sensor would be necessary otherwise there could be a lot of false triggers. Temperature: The DPS310 also shows the temperature value which we can use to alert us about any mishap that could happen to the patient, for instance a fire. If the temperature increases to a specific value, let's say 45℃ it alerts the caretaker. But because the DPS310 sensor is not attached directly to the skin (at least in this use-case) what we get isn't the body temperature, but it would be more accurate to say that it's the temperature of the Sensor Hub Nano. Note: All of the above graphs are created using SESG2 Evaluation software provided by Infineon. I have not mentioned this before, but a buzzer and a switch should also be present in the system and they will be very helpful too. For example, a buzzer could be used to attract the patient's attention, when it would be time to take medicine for instance, and the switch could be used as a safety device. int isButtonPressed = !digitalRead(2); // Invert state, since button is "Active LOW"
It is taken from the Blynk sample code, and uses an interrupt to check the button. This could be used by the patient to alert the caretaker in any emergency, like a fall which wasn't detected by the fall detection algorithm. You can get the full sample code here, which sends an email once a button is pressed. The buzzer could be used to produce tones (using the Arduino tone() command - more information here), to remind the patient for a task such as medication or exercise. A major part of the project, which the user actually looks at, is the display. The Nokia 5110 displays are commonly available, easy to set up and cheap, but they aren’t that flashy, especially when used in such a system. OLED displays with a higher resolution will be a very good alternative to it, and you can easily modify the code to work with one because I used the u8g2 library (github here). Choose any of the display models from here, and add it to the start of the sketch (removing the Nokia 5110 line, of course!). You will need to wire it up according to what it is in the code and you’re ready to go. You can also use bitmap images with a higher resolution display. You can also change the font for the text on the display, select fonts from the huge list here and edit the name of the font in the code. Note: You may have to change the pixel positions for the text in the code if you use a display with a higher resolution. That was just a brief description of the library used to get the display working. But, now I will tell you how to edit the code to get Alzheimer's Assistant to show the time or the Sensor Hub Nano data (temperature, Altitude and pressure). Note: The time displayed on the screen could go up or down a minute, as it is synced from the internet, but despite that, I have tested it for a long time and have found it to be very accurate (just a difference of a few seconds). But that's not all for the display. As I said in the start, Alzheimer's Assistant should be able to remind the patient of the tasks which need to be done daily, such as when to take medications or to remind the patient to exercise. For that, we will be using the Eventor widget (check here for details) in Blynk. 1 / 3 • Open the Eventor widget and click "Add New Event"
In the above example, the Eventor widget is used to set up a fall detection notification. //This is just a tone, I haven't made it in the main code, but you can if you want! The eventor widget could, as said above, be used for a number of things. For example, you could set that an increase in temperature could result in sending an e-mail, and with no code modification! As this had no use for me, I did not add it it in the main code, but you could always do so as needed (The commands are present, you just need to add them with a bit of logic in the main sketch). Blynk can allow any Arduino project to easily harness the power of IFTTT. This is because you can use Blynk to send a webhook request to the IFTTT Webhooks channel (previously called Maker channel), and you could create an IFTTT applet which waits for the webhook to be triggered (from the Blynk and Arduino side) and you could get it to trigger anything else in response to that. And using webhooks to trigger IFTTT is not the only method. IFTTT can also be triggered by using Blynk to send emails and tweets. 1 / 5 • Go to ifttt.com and login, then click "New Applet"
You have now made an applet. Time to test it. And, instead of SMS, you could just as well use phone calls, or even Twitter and Facebook, if you want, and it's just as simple That is the power of IFTTT. It's the same thing as my smart home controller project here, and I also discussed it in detail there, but it is a great thing which I couldn't go by without mentioning. By now, almost all of the electronics part of the project is complete, but a few things still remain. Read on for them, and in the end, I will list the future work which should be done to improve this project. The MKR1000 has a port for a LiPo battery, which means you could attach one. But I don't have one at the moment so I will not be going into that but you should check out the website for the Arduino MKR1000 if you need information on that. For charging, you have two options, using the MKR1000 USB port directly, and the other one is to use wireless charging, if you have it. I will be using the wireless charging for it. This is because I already have a wireless charging receiver and transmitter made by Futara Elettronica. To use the receiver and transmitter, it's just a simple matter of providing the specified voltage to the transmitter. That will be the 'dock', where you can place Alzheimer's Assistant to charge. At the receiver side, you will just have to cut and attach a spare USB micro B cable (which goes to the MKR1000 USB port) and connect the other side to VCC and ground by looking at the pinout. Note: I do not yet have the privilege of a laser cutter or 3D printer, so the STL file is just intended for showing how the final project looks like and it's not to scale. This concludes the documentation for Alzheimer's Assistant, but I would still like to include the future work section to describe the things which I very much wanted to do for the project, but couldn't, due to some reason or the other. Making a proper enclosure for it. Now I am just testing it on a breadboard but if I get access to a laser cutter or 3D printer I will update the documentation with that. Using a Bluetooth 4.0 module instead of this one. Or even better, using just the DPS310 Sensor instead of the Sensor Hub Nano. This would decrease the cost for the project overall, as it will eliminate the use of the Sensor Hub Nano and the bluetooth module; the DPS310 itself is a available for cheap. It's a matter of editing the main code to get temperature, pressure and altitude values from the DPS310 only, the rest of the part is done. Using a secondary sensor to work along with the DPS310 for fall detection and the location detection. This would decrease the occurrence of both, false positive and false negative alerts. Most probably an accelerometer and a motion detector will be needed for both. Adding a pulse sensor. I did not have one, so I couldn't add that. It should be a great addition to the project. Using a higher resolution display, preferably an OLED. With that, graphics can also be included and that would be pretty neat. Working on improving the battery life for the project. This can be done by using a deep sleep mode in the MKR1000, but I haven't used it in the code yet. Thanks for reading, and hope you liked my project. Feel free to give me your opinions and ideas about the project. This is just to show how I intend the enclosure to look like. It's not at all to scale! 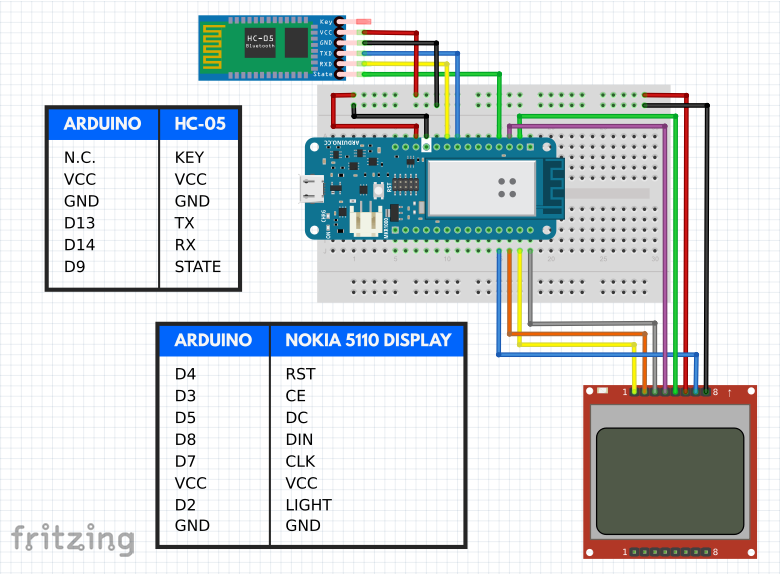 This diagram is used when getting your HC-05 in AT mode and configuring it, using the Arduino MKR1000. //You can send a notification using only the notification widget too!